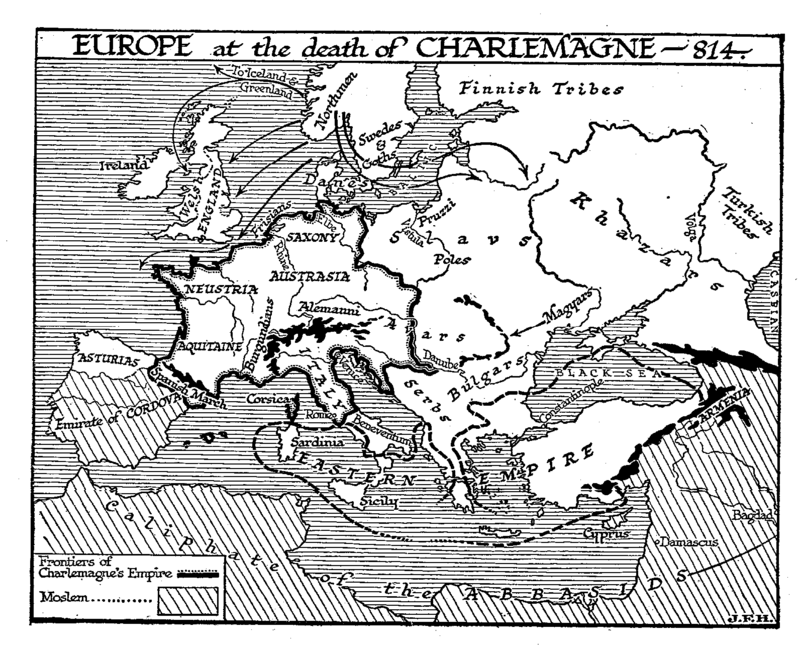 Through Charlemagne the tradition of the Roman Cæsar was revived in Europe. The Roman Empire was dead and decaying; the Byzantine Empire was far gone in decline; but the education and mentality of Europe had sunken to a level at which new creative political ideas were probably impossible. In all Europe there survived not a tithe of the speculative vigour that we find in the Athenian literature of the fifth century B.C. There was no power to postulate a new occasion or to conceive and organize a novel political method. Official Christianity had long overlaid and accustomed itself to ignore those strange teachings of Jesus of Nazareth from which it had arisen. The Roman Church, clinging tenaciously to its possession of the title of pontifex maximus, had long since abandoned its appointed task of achieving the Kingdom of Heaven. It was preoccupied with the revival of Roman ascendancy on earth, which it conceived of as its inheritance. It had become a political body, using the faith and needs of simple men to forward its schemes. Europe drifted towards a dreary imitation and revival of the misconceived failures of the past. For eleven centuries from Charlemagne onwards, «Emperors» and «Cæsars» of this line and that come and go in the history of Europe like fancies in a disordered mind. We shall have to tell of a great process of mental growth in Europe, of enlarged horizons and accumulating power, but it was a process that went on independently of, and in spite of, the political forms of the time, until at last it shattered those forms altogether. Europe during those eleven centuries of the imitation Cæsars which began with Charlemagne, and which closed only in the monstrous bloodshed of 1914-1918, has been like a busy factory owned by a somnambulist, who is sometimes quite unimportant and sometimes disastrously in the way. Or rather than a somnambulist, let us say by a corpse that magically simulates a kind of life. The Roman Empire staggers, sprawls, is thrust off the stage, and reappears, and-if we may carry the image one step further-it is the Church of Rome which plays the part of the magician and keeps this corpse alive. And throughout the whole period there is always a struggle going on for the control of the corpse between the spiritual and various temporal powers. We have already noted the spirit of St. Augustine’s City of God. It was a book which we know Charlemagne read, or had read to him-for his literary accomplishments are rather questionable. He conceived of this Christian Empire as being ruled and maintained in its orthodoxy by some such great Cæsar as himself. He was to rule even the Pope. But at Rome the view taken of the revived empire differed a little from that. There the view taken was that the Christian Cæsar must be anointed and guided by the Pope-who would even have the power to excommunicate and depose him. Even in the time of Charlemagne this divergence of view was apparent. In the following centuries it became acute. The idea of the revived Empire downed only very gradually upon; the mind of Charlemagne. At first he was simply the ruler of his father’s, kingdom of the Franks, and his powers were fully occupied in struggles with the Saxons and Bavarians, and with the Slavs to the east of them with the Moslem in Spain, and with various insurrections in his own dominions. And as the result of a quarrel with the King of Lombardy, his father-in-law, he conquered Lombardy and North Italy. We have noted the establishment of the Lombards in North Italy about 570 after the great pestilence, and after the overthrow of the East Gothic kings by Justinian. These Lombards had always been a danger and a fear to the, Popes, and there had been an alliance between Pope and Frankish King against them in the time of Pepin. Now Charlemagne completely subjugated Lombardy (774), sent his father-in-law to a monastery, and carried his conquests beyond the present north-eastern boundaries of Italy into Dalmatia in 776. In 781 be caused one of his sons, Pepin, who did not outlive him, to be crowned King of Italy in Rome. There was a new Pope, Leo III, in 795, who seems from the first to have resolved to make Charlemagne emperor. Hitherto the court at Byzantium had possessed a certain indefinite authority over the Pope. Strong emperors like Justinian had bullied the Popes and obliged them to come to Constantinople; weak emperors had annoyed them ineffectively. The idea of a breach, both secular and religious, with Constantinople had long been entertained at the Lateran, and in the Frankish power there seemed to be just the support that was necessary if Constantinople was to be defied. So at his accession Leo III sent the keys of the tomb of St. Peter and a banner to Charlemagne as the symbols of his sovereignty in Rome as King of Italy. Very soon the Pope had to appeal to the protection he had chosen. He was unpopular in Rome; he was attacked and ill-treated in the streets during a procession, and obliged to fly to Germany (799). Eginhard says his eyes were gouged out and his tongue cut off; He seems, however, to have had both eyes and tongue again a year later. Charlemagne brought him back and reinstated him (800). Then occurred a very important scene. On Christmas Day, in the year 800, as Charles was rising from prayer in the Church of St. Peter, the Pope, who had everything in readiness, clapped a crown upon his Head and hailed him Cæsar and Augustus. There was great popular applause. But Eginhard, the friend and biographer of Charlemagne, says that the new emperor was by no means pleased by this coup of Pope Leo’s. If he had known this was to happen, he said, «he would not have entered the church, great festival though it was» No doubt he had been thinking and talking of making himself emperor, but he had evidently not intended that the Pope should make him emperor. He had some idea of marrying the Empress Irene, who at that time reigned in Constantinople, and so becoming monarch of both Eastern and Western Empires. He was now obliged to accept the title in the manner that Leo III had adopted as a gift from the Pope, and in a way that estranged Constantinople and secured the separation of Rome from the Byzantine Church. At first Byzantium was unwilling to recognize the imperial title of Charlemagne. But in 810 a great disaster fell upon the Byzantine Empire. The pagan Bulgarians, under their Prince Krum (802-814), defeated and destroyed the armies of the Emperor Nicephorus, whose skull became a drinking-cup for Krum. The greater part of the Balkan peninsula was conquered by these people. (The Bulgarian and the English nations thus became established as political unities almost simultaneously.) After this misfortune Byzantium was in no position to dispute this revival of the empire in the West, and in 812 Charlemagne was formally recognized by Byzantine envoys as Emperor and Augustus. So the Empire of Rome, which had died at the hands of Odoacer in 476, rose again in 800 as the «Holy Roman Empire». While its physical strength lay north of the Alps, the centre of its idea was Rome. It was therefore from the beginning a divided thing of uncertain power, a claim and an argument rather than a necessary reality. The German sword was always clattering over the Alps into Italy, and missions and legates toiling over in the reverse direction. But the Germans could never hold Italy permanently, because they could not stand the malaria that the ruined, neglected, undrained country fostered. And in Rome, as well as in several other of the cities of Italy, there smouldered a more ancient tradition, the tradition of the aristocratic republic, hostile to both Emperor and Pope. The Lateran was the earlier palace of the Popes in Rome. Later they occupied the Vatican.